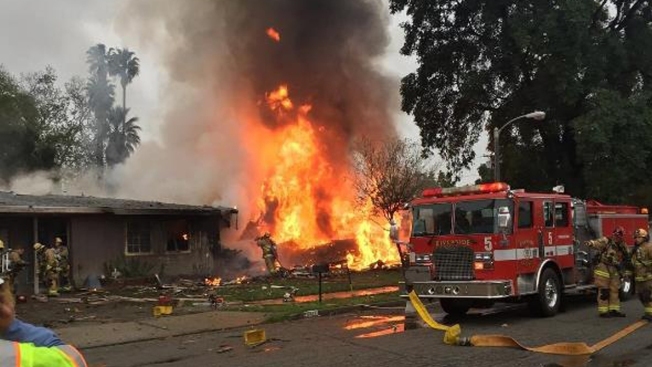 Riverside firefighters provided new details Wednesday on their rescue of a San Jose woman who survived a plane crash Monday that killed her parents and family friend. Fire crews faced a wall of flames as they entered a burning home to rescue Stacey Pierce, who had been ejected from the twin-engine Cessna 310. "We took a measured and calculated risk entering the room with live fire and a lot of debris surrounding us," fire engineer Paul Seawright said. With debris from the plane and flames all around, firefighters heard the mother of four groaning. "We finally found where she was at, with Paul, and at that point, they were outside pulling her out of our hands," firefighter Dave Nelson said. Once Pierce was in safe hands, Capt. Chuck Tasker fell to his knees. "It was difficult," Tasker said. "I was just emotionally and physically exhausted. I dropped to my knees for a moment to catch my breath and kind of regained my composure, and immediately my next thought was is anyone else in the house." There was no one else to rescue. The only other crash survivor, Silvia Farelas, already was getting emergency care. Farelas' daughter, 22-year-old Adine Farelas, died, as did Pierce's parents, Nouri and Dana Hijazi. Loved ones have started GoFundMe pages for both families, who had been united by children and grandchildren on a middle school cheer team. A San Jose community is now rallying around the two mothers recovering in Southern California hospitals with critical injuries.